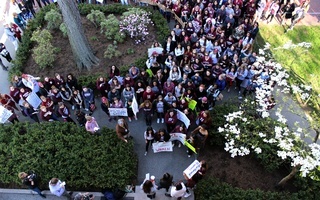 UPDATED: May 5, 2016, at 1:47 p.m.
Three graduate leaders of the all-female Sablière Society have questioned administrators’ actions toward Harvard’s final clubs, accusing them of ignoring the input of female clubs. In an op-ed, published Wednesday in The Crimson, the women also charged that administrators were pushing for final clubs to adopt co-ed policies “primarily as a form of damage control” after a slew of negative publicity. In an academic year in which final clubs and their membership policies have been the subject of intense scrutiny from both Harvard administrators and the national press, the five all-female clubs have been largely absent from media attention until now. The graduate leadership of the Sablière, or “Sab,” have staked out a position somewhere in between the stances of all-male clubs, many of which have expressed staunch opposition to pressure to go gender neutral, and College administrators who have repeatedly insisted that single-gender clubs move swiftly to widen their membership policies. The op-ed, co-written by Sablière graduate president Ariel Stoddard ’10, cultural chair Morgan E. Arenson ’06, and legal chair Eugenia B. Schraa ’04, Sablière leaders, expressed general agreement with the University’s aim of promoting “gender inclusivity” in the historically single-gender organizations, but contended that Dean of the College Rakesh Khurana and other administrators did not include them in conversations sooner and are failing to consider how co-ed moves could impact Harvard women. Stoddard, Arenson, and Schraa, a former Crimson News editor, wrote that the administration took too long to include women in meetings they initially held only with leaders of the all-male final clubs. They also expressed frustration that some of the concerns they have raised are now falling on deaf ears. Finally, the op-ed suggested that a “barrage of media attacks” surrounding issues of sexual assault is driving Harvard to “quick-fix solutions” with not enough consideration to how Harvard women could be affected. Khurana, through College spokesperson Rachael Dane, declined to comment on the Sablière op-ed, continuing a pattern of public reticence surrounding his actions towards the clubs. Dane sent a statement from Assistant Dean of Student Life David R. Friedrich. According to Stoddard, Arenson, and Schraa, the Sablière has accepted every invitation to meet that administrators have extended them. 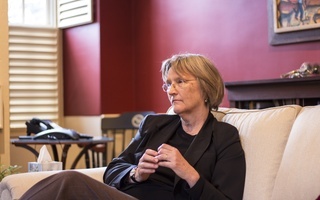 As Khurana, Freidrich, and other College administrators attend meetings with the clubs, University President Drew G. Faust and even the Harvard Corporation, Harvard’s highest governing body, have also been involved in discussions about the centuries-old institutions and their place on campus. In an interview, Sablière graduate president Stoddard clarified that her disappointment went beyond exclusion from earlier meetings. Stoddard said she and other Sablière leaders have felt they were “having an agenda pushed on us” by administrators at the meetings, adding that she hoped the op-ed would produce a better debate about the place of final clubs on campus. 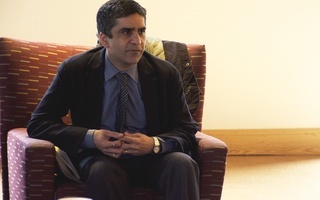 “I would hope that we hear from Dean Khurana or from one of the other deans or from President Faust and we can have a true conversation about this,” Stoddard said. The op-ed was centrally concerned with how all-male clubs might make the transition to gender neutral membership. Citing the examples of the Spee and the Fox, two traditionally all-male clubs that added women to their ranks in the fall, Stoddard, Arenson, and Schraa expressed concerns about clubs with all-male leadership and all-male alumni extending invitations to sophomore women. Mergers between all-female and all-male clubs could present an alternative to simply going co-ed, as the Fox and the Spee did. Some male clubs are the result of past mergers between multiple groups. The all-male Phoenix S.K., for instance is an amalgam of three former clubs: the Phoenix, the Sphinx, and the Kalumet. While mergers between female and male clubs have been discussed in the past, none have taken place yet. The Sablière leaders’ op-ed comes in the wake of public statements from the then-graduate president of the Porcellian Club and the graduate president of the Fly Club, both of whom were also critical of the administrators’ actions surrounding final clubs this year. While Khurana and Faust have remained tight-lipped on what may be included in a new set of policies expected to be proposed before the end of this academic year, Schraa and her colleagues had little doubt about one thing when composing the op-ed. “The three of us are not even thinking in a world where it’s possible to remain single-gender. We’re just making the assumption that it’s not,” Schraa said in an interview.